Whether you need your existing roof repaired, or need a new roof altogether, you’re going to need a professional roofer to take care of the work. While DIYers might decide they can tackle the project, your roof is such an important part of your home that you don’t want to treat it the same way you would when making repairs to other parts of your home. Faulty repairs can allow moisture inside that could lead to mold, or let heat leak out that could lead to much higher heating bills, or even allow pests inside that you really don’t want to take up residence in your home! At the Roof Authority, Inc. we put three decades of experience behind our work, and are highly qualified to diagnose issues or repair your entire roof, if necessary. Don’t trust this integral part of your home to inexperience—we’ve got you covered. Proper licensure ensures that your roofer is compliant and builds/repairs your roof to your city’s code. 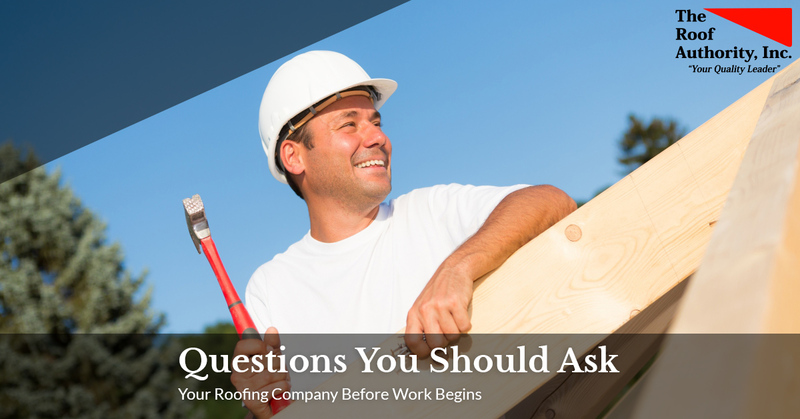 The last thing you want is to invest so much money into a roof, only to have the inspector come by and deliver the bad news: your roof has failed inspection. Insurance protects you against accidents the roofer caused, which, while they likely took every precaution to prevent, unfortunately happened. If your house burns down or floods, you’re protected. Don’t ever take your contractor’s word for it. Ask for proof of licenses and insurance (here is our proof of insurance and licensure)! There are so many fly-by-night outfits in the world of contracting. You’ll especially see them pop up after a storm that caused a lot of damage. Again, refer to the first item in this list. If they don’t carry a valid proof of insurance and licensure, you’re not protected if they don’t finish the work, do shoddy work, or cause damage to your home. You will then have to pay for another contractor to come in and finish the work. Save yourself the money and heartache, and ask for proof of a local address, and do your research. We are located at 6771 N. Old Dixie Hwy in Fort Pierce, and you can call us any time at 772-468-7870. Will You Clean Up After Installation? Imagine having a new roof installed, which creates…well, a large mess. It’s unavoidable. But even with the excitement of a gorgeous, brand-new roof, you have a yard full of wood scraps, sawdust, nails, and other building waste. That’s not your responsibility, yet many roofers do their job and skip off to the next job without cleaning up every last scrap. The Roof Authority, Inc. cleans up after our work, leaving your space looking even better than before. You won’t have anything to do but stand back and enjoy the new view. The Roof Authority, Inc. is your source for roof repair and new roof installation. We’ve been in business since 1993, and have three decades of experience behind our work. Trust us to your residential roofing job. Contact us for a free estimate today!